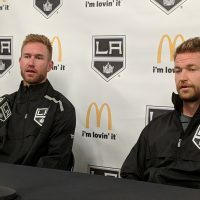 Never one to shy away from the media, Kings captain Dustin Brown met with a small group gathered at the team’s training facility in El Segundo earlier today. Following his club missing the playoffs for the first time since 2009, there was obvious disappointment and many in management, as well as inside the locker room, are still trying to piece together exactly what went wrong over the past eight months. More importantly, all involved have already begun working on solutions to improve things moving forward. 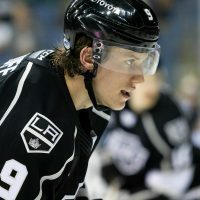 On a personal note, Brown posted only 11 goals this season, a personal low when playing a full 82-game season. 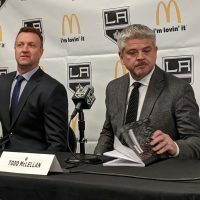 Some of that comes down to a chicken-or-egg debate after coach Darryl Sutter often slotted him in a bottom-6 role, rather than alongside Anze Kopitar, who he co-lead the team with in goals and points during the 2012 Stanley Cup Playoffs. On what was it like waking up Sunday morning and realizing everything was over? 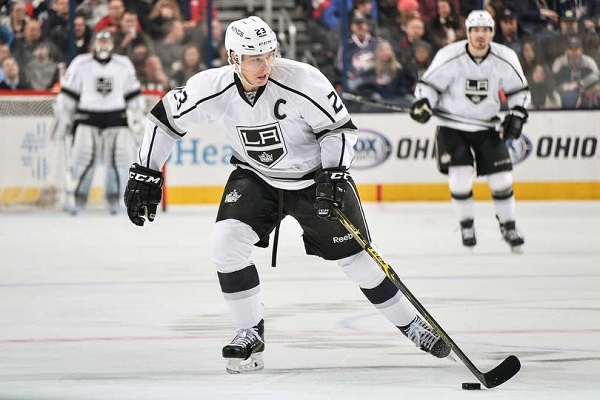 What do Brown, Anze Kopitar, and Darryl Sutter think about the possibility of Jarret Stoll and Justin Williams not returning to the Kings for next season? They break it all down here. 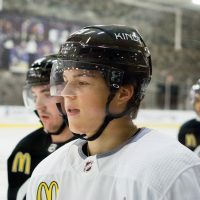 Also, we have a lot of interesting comments from Dean Lombardi at yesterday’s end-of-season media session posted here.